On April 3, 2019, Conkle, Kremer & Engel attorneys John Conkle and Raef Cogan joined the Personal Care Products Council (“PCPC”) in Sacramento, California to lobby members and staff of the California Legislature on pending legislation important to members of the personal care products industry, including Senate Bill 574 and Assembly Bill 495. CK&E attorneys, PCPC staff and participating industry representatives visited legislative offices to advocate for positions favored by personal care products industry members. Over the course of more than 15 meetings with legislators and their aides, the group focused its advocacy on two pending bills that, if enacted, would have significant consequences for the U.S. cosmetics industry as a whole. Conkle, Kremer & Engel has previously written about Senate Bill No. 574 (“SB 574”) introduced by Senator Connie Leyva and Assembly Bill No. 495 (“AB 495”) introduced by Assembly Members Al Muratsuchi and Buffy Wicks. These are important bills that if enacted would have significant consequences for the U.S. cosmetics industry as a whole. SB 574, also known as the “Toxic Fragrance Chemicals Right to Know Act of 2019,” would require cosmetic manufacturers to disclose fragrance of flavor ingredients that appear on any one of 27 “designated lists.” CK&E attorneys explained during the meetings that a viable version of this bill may be presented in the future, but that as written SB 574 threatens cosmetic companies’ confidential business information, results in duplicative regulation and relies on faulty, unscientific “lists” to determine what information manufacturers must disclose. AB 495, is entitled the “Toxic Free Cosmetics Act,” and would dramatically increase the number of cosmetics listed as “adulterated,” without justification. CK&E attorneys explained that under AB 495 as proposed, any cosmetic that contained even trace amounts of identified ingredients would be labeled “adulterated” and would be banned outright. Some ingredients sound scary, like lead, but are in fact naturally occurring and cannot be completely eliminated from cosmetic (or many other) products. Others are preservatives that have been deemed completely safe for use in cosmetics by the FDA and other regulatory bodies. Both SB 574 and AB 495 are coming up for committee vote soon. Conkle, Kremer & Engel will stay apprised of the results and will provide updates on this legislation that is important to the cosmetics industry. PCPC California Lobby Day also featured presentations from Allen Hirsch, Chief Director of the California Office of Environmental Health Hazard Assessment (“OEHHA”), Karl Palmer from the Department of Toxic Substances Control (“DTSC”), Joseph Calavita from the Air Resources Board, and Senator Bill Quirk, Chair of the Environmental Safety and Toxic Materials Committee. 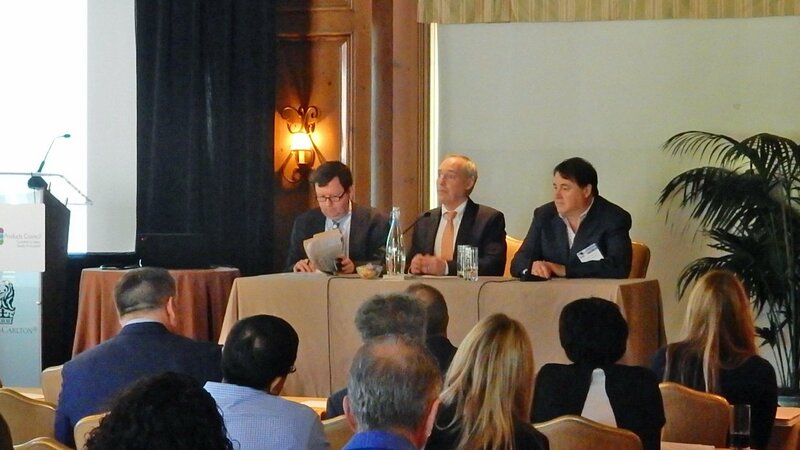 The regulators spoke about important upcoming actions by their agencies. Senator Quick focused on the importance of protecting our environment from toxins, primarily greenhouse gasses. Each of these presenters stressed a need for more information sharing between the industry and the respective regulatory and legislative bodies. California has always led the way when it comes to regulating cosmetic products, and bills recently introduced by Senator Connie Leyva (Senate Bill No. 574 or SB 574) and Assemblymembers Al Muratsuchi and Buffy Wicks (Assembly Bill No. 495 or AB 495) is in keeping with California’s reputation as a trailblazer in the cosmetics regulatory space. SB 574, the “Toxic Fragrance Chemicals Right to Know Act of 2019,” was introduced last month. It would require cosmetic manufacturers, starting July 1, 2020, to disclose whether any of their cosmetic products contains a toxic fragrance or flavor ingredient. Fragrance or flavor ingredients that appear on any one of 27 “designated lists” would be subject to public disclosure. The designated lists include chemicals listed as known to cause cancer or reproductive toxicity pursuant to California’s Proposition 65; chemicals classified by the European Union as carcinogens, mutagens or reproductive toxins; chemicals included in the European Union Candidate List of Substances of Very High Concern; and Group 1, 2A or 2B carcinogens identified by the International Agency for Research on Cancer (IARC) among many others. Existing law – the California Safe Cosmetics Act of 2005 (“Safe Cosmetics Act”) – requires cosmetic manufacturers to disclose to the California Department of Public Health (CDPH) Safe Cosmetics Program whether any of their cosmetic products contain chemicals known or suspected to cause cancer or reproductive toxicity. The Safe Cosmetics Act’s list of reportable ingredients is compiled from a more far limited set of five designated lists. This self-reported information, in turn, is publicly available through the CDPH’s Safe Cosmetics Database. While the Safe Cosmetics Act does not exempt fragrances and flavorings from being reported, the reportable chemicals in those cases are often identified simply as “trade secrets.” The proposed legislation would require the disclosure of the identities of the reportable chemicals or ingredients, but for trade secret purposes, would not require the weight or amount of a fragrance or flavor ingredient to be disclosed or any disclosure of how the fragrance or flavor is formulated. In addition, a manufacturer would not have to disclose any fragrance or flavor ingredients that are not found on any of the 27 designated lists. It is important to note that SB 574 as proposed would not ban or otherwise regulate the use of any fragrance or flavor ingredients. AB 495, also introduced in February 2019, would amend both California’s Sherman Food, Drug and Cosmetic Law and the Safe Cosmetics Act. The bill would also amend the Safe Cosmetics Act by requiring referrals to be made to the Department of Justice for any sale of adulterated cosmetics, as well as any violation of the Safe Cosmetics Act. If passed, the legislation would have the effect of requiring companies doing business anywhere in the United States to reformulate their cosmetics to remove these ingredients, effectively creating a nationwide ingredient ban. The bill comes as the FDA confirmed that cosmetic products sold in 2017 by Claire’s and Justice tested positive for asbestos. It has become clear that California’s leadership position on cosmetic regulation has effectively driven changes in cosmetic products and labeling throughout the United States. Conkle, Kremer & Engel will continue to follow and update these important developments affecting the cosmetics industry. Efforts to pass AB 495 have temporarily stalled. On April 9, 2019, the Assembly’s Environmental Safety and Toxic Materials Committee postponed a scheduled vote to move the bill to the Assembly Health Committee due to lack of support. The bill is not expected to be brought back again until next year. It is anticipated that the bill will be in a revised form when reintroduced. Conkle, Kremer & Engel will continue to monitor the developments of AB 495. On May 9, 2018 Conkle, Kremer & Engel attorney John A. Conkle presented on “The State of the States” panel at the 2018 Personal Care Products Council’s Legal & Regulatory Conference. The panel focused on the increasingly strong role of state legislatures and state regulatory bodies in addressing issues of importance to the personal care products and cosmetics industries. The panel featured lively discussion of issues arising from the evolving patchwork of laws and regulations among numerous states, including California’s infamous Proposition 65, slack fill laws, and labeling and ingredient disclosure regulations, ingredient phase-out requirements and outright bans, volatile organic compound limitations to protect air quality, and animal testing regulations. The discussion included the importance of preservation and presentation of evidence to support manufacturers’ positions, including testimony in depositions and at trial. The panel’s presentation is available here for review. Contact John Conkle to discuss the latest issues affecting the state of the personal care products and cosmetics industries. Conkle, Kremer & Engel attorney John A. Conkle will be on the panel opening the 2018 Personal Care Products Council’s Legal & Regulatory Conference. The panel will present “The State of the States,” which will focus on the increasingly strong interest of state legislatures and state regulatory bodies in addressing issues of importance to the personal care products and cosmetics industries. States have come to recognize that, with the U.S. Congress largely gridlocked and federal regulatory agencies in a deregulation mood, the path is open for the states to regulate consumer industries in manners that they deem fit. The result is a continuously evolving patchwork of laws and regulations that can be difficult for industry participants to navigate. Issues to be discussed at the May 9, 2018 panel presentation include California’s infamous Proposition 65, slack fill laws, and labeling and ingredient disclosure regulations that include even public databases disclosing products’ ingredients found by state governments to be detrimental. Further, state regulations can include ingredient phase-out requirements and outright bans, volatile organic compound limitations to protect air quality, and even animal testing regulations that can affect industry participants’ ability to compete in international trade. A lively discussion is inevitable given the rich and topical subject matter and the vital industry interests affected. The rest of the Legal and Regulatory Conference program should be just as engaging, covering topics such as employment law, cannabis (THC, CBD, marijuana extracts and hemp) in cosmetics and personal care products. The many other topics to be covered in the three-day conference in Savannah, Georgia can be found in the conference program. 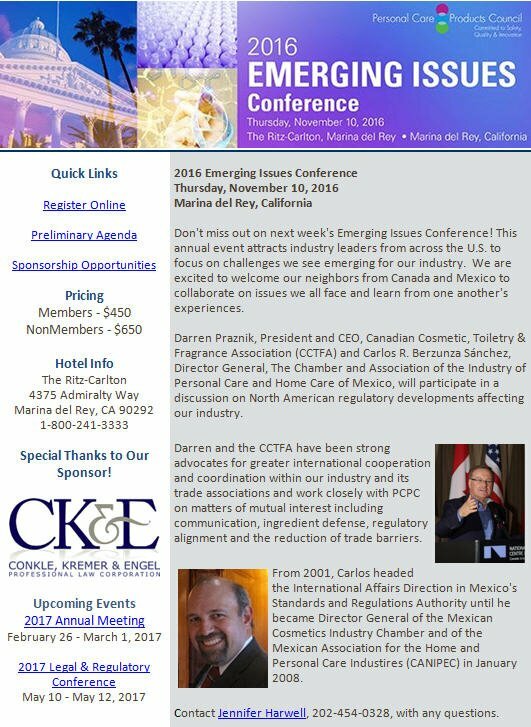 Conkle, Kremer & Engel is proud to once again sponsor the Personal Care Products Council Emerging Issues Conference on November 10, 2016 at the Ritz Carlton Hotel in Marina Del Rey, California. John Conkle will attend the conference on behalf of CK&E to address current legal trends and developments in the cosmetic and personal care products industry. This annual event by the PCPC – the leading national trade association for the cosmetic and personal care products industry – is a must-attend for beauty companies across the country, with its unique focus on the many challenges that are on the horizon for the beauty industry. The presentation this year will include a particularly timely focus on international trade issues affecting the cosmetics industry, including appearances by industry representatives from Canada and Mexico. This year’s conference is particularly topical panel discussion entitled “2016 Elections: What happened and what it means for you!” The panel included Dan Schnur, a leading political strategist and Director of Jesse Unruh Institute of Politics at University of Southern California, which runs the USC-Los Angeles Times Daybreak Poll that was one of the few polls to correctly predict Donald Trump’s election. In comments during their PCPC presentation, the panel noted that if President Trump follows through with pledges such as environmental regulation rollbacks, it is likely that California will respond by enacting its own additional rules and regulations. CK&E is pleased to once again participate in this annual event and to offer its experience and insight into legal issues affecting the industry to the PCPC and its members. Once again, Conkle, Kremer & Engel attorneys Mark Kremer and Kim Sim have been honored to participate in and contribute to the revolutionary Beauty Industry Market Access (BIMA) program, led by beauty industry guru Patty Schmucker of American Made Beauty. BIMA is a multi-day intensive domestic and international trade and business education program taught by leading health and beauty industry experts. BIMA participants focus on key principles essential to expand their personal care products businesses both in the U.S. and overseas. 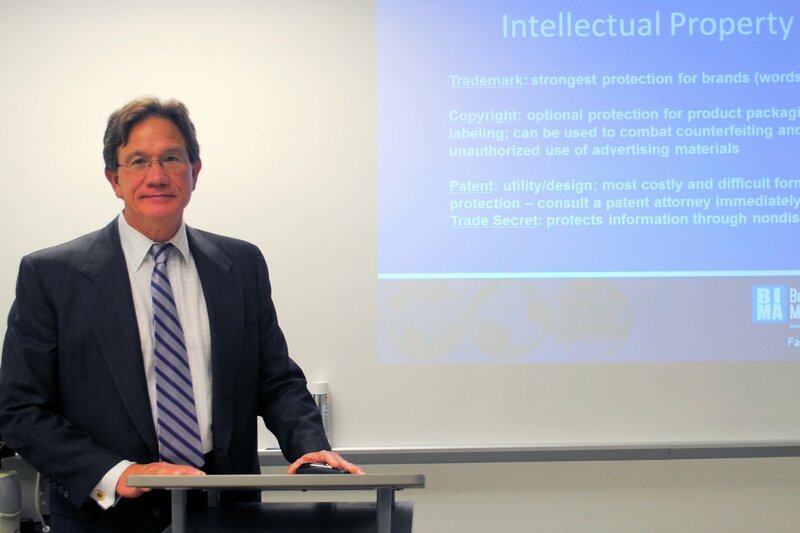 Mark contributes to the BIMA educational program by teaching modules on domestic and foreign intellectual property protection and international distribution agreements. Participants are particularly advised about cost-effective methods of protecting their intellectual property internationally, such as international trademark registrations through the Madrid System, which can offer a centralized application process for trademark registration in over 90 countries based on a brand owner’s domestic application or registration. Kim adds her expertise in domestic regulatory compliance, including Prop 65, California Organic Products Act (COPA), Safe Cosmetics Act, California Air Resources Board (CARB) regulations and survey requirements, and federal and state Made in the USA regulations. BIMA is sponsored by Universal Companies, which has been in the beauty industry for over 18 years and is an important distributor of more than 300 brands in the spa, salon, esthetics and massage market, as well as their own proprietary brands. In partnership with the California Trade Alliance (CTA), access to international trade shows are available to companies that participate in the BIMA programs. BIMA participants can exhibit in the popular California Pavilion regularly sponsored by CTA at Cosmoprof Bologna and Cosmoprof Hong Kong, among the world’s largest and most important beauty industry trade shows. Conkle, Kremer & Engel attorney John Conkle is proud to have again been invited to join the Personal Care Products Council’s delegation for California Lobby Day, an annual PCPC event held at the Capitol in Sacramento, California. The Personal Care Products Council (PCPC) represents the personal care products, beauty and cosmetics industry at the federal, state and local level on issues of interest to the industry. California Lobby Day represents a unique opportunity for industry leaders to meet with legislators including Leadership, key Committee Chairs and members of the Legislative Women’s Caucus, state officials, and their staff members and to engage in open discussions about legislative and regulatory issues affecting the personal care products industry. The day is expected to include briefings in the Governor’s Office by the executive department personnel and meetings with staff in the offices of members of the State Legislature, as well as a reception for members of the California Legislature, personnel from the Office of Governor Brown, and PCPC members and staff. Among those with whom John is expecting to meet are Nancy McFadden (Executive Secretary to Governor Brown); Carol Monahan-Cummings (Office of Environmental Health Hazard Assessment); Meredith Williams (Deputy Director of Safer Consumer Products and Workplaces Program, Department of Toxic Substances Control); and Panorea Advis (Director of the Governor’s Office of Business and Economic Development). Conkle, Kremer & Engel attorney Eric S. Engel attended the ICMAD Regulatory Forum in Newport Beach, California on February 17, 2016. The Forum has been an annual event for more than a decade, and offers CK&E an opportunity to meet with professionals in the personal care products industry to discuss important legislative and regulatory issues affecting the industry. Among the topics of concern to the beauty industry, on which CK&E stays current through participation in the Forum and otherwise, include labeling and advertising claims, EU labeling and regulatory compliance, and California regulatory compliance, including Prop 65 issues, California Safe Cosmetics Act and California Air Resources Board (CARB), California Safer Consumer Products regulations, and the potential for class action liability. One topic that generated particular industry interest was the pending “Personal Care Products Safety Act” introduced by Senators Feinstein and Collins. Conkle, Kremer & Engel is proud to again be the subject of a feature interview in the industry-leading publication, Beauty Industry Report (BIR). BIR is a monthly 24-page executive newsletter for professionals that focuses on the emerging trends affecting the beauty industry. CK&E’s feature interview assessed the latest legal trends, based on CK&E’s decades of experience in the industry. Topics covered included trademark and brand protection, both international and domestic, regulatory compliance issues such as California’s Proposition 65 and the Safe Cosmetics Act, issues in manufacturer-distributor relationships, and more. The attached article includes links to topical blog posts and websites referenced in the interview. CK&E wishes to thank BIR’s Mike Nave for taking the initiative to disseminate information about these important industry issues. BIR proved again that working in the beauty industry without reading BIR is like working in finance without reading The Wall Street Journal. Conkle, Kremer & Engel attorney Mark Kremer has been honored to participate in and contribute to the revolutionary Beauty Industry Market Access (BIMA) program through the Center for International Trade Development (CITD). The BIMA program was developed and is led by beauty industry guru Patty Schmucker and international trade expert Cesar Arellanes, the Director of CITD in Long Beach. BIMA is a five week intensive international trade and business education program taught by leading health and beauty industry experts. BIMA participants focus on key program principles distinct to conducting business overseas, receive bi-monthly objectives for assessing their business, and ultimately produce an export growth plan exclusive to their business. Participants also have access to upcoming trade missions to the world’s largest emerging market beauty trade shows – effective venues for executing learned principles and business plans. Mark contributes to the BIMA educational program by teaching modules on domestic and foreign intellectual property protection, domestic regulatory compliance, and international distribution agreements. Participants are particularly interested in cost-effective methods of protecting their intellectual property internationally, such as international trademark registrations through the Madrid System. The Madrid System offers a centralized application process for trademark registration in over 90 countries based on a brand owner’s domestic application or registration. Participants are also interested in CK&E’s practical approach to domestic regulatory compliance, including California’s evolving green chemistry initiative, Safe Cosmetics Act and Proposition 65. Participants have also benefited from CK&E’s tips for forging fruitful business relationships with distributors, based on decades of experience representing clients in the personal care products industry.